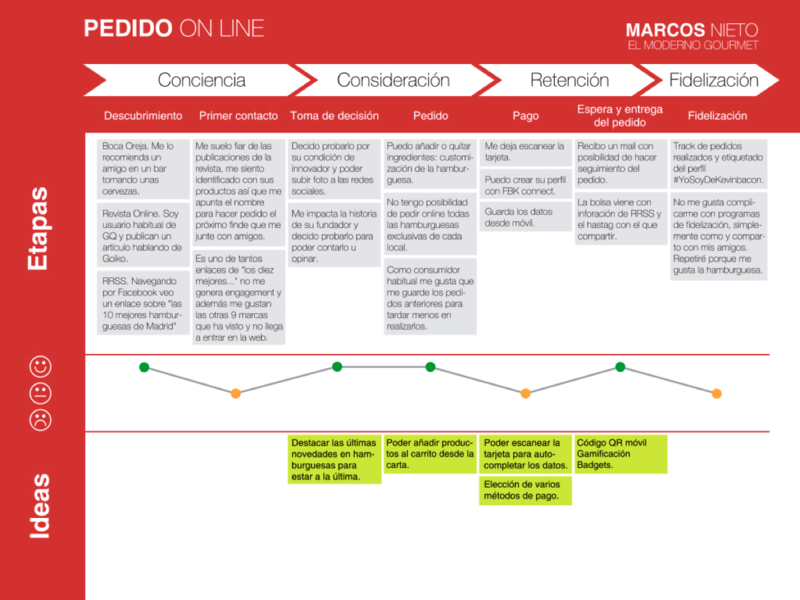 Customer Journey maps, how to work them? The maxim of all those who work in user experience is to make life easier for our users. Working positioning our users in the center makes us empathize and worry about them. The customer journey maps have the same basic rule; focus on our users. For this, is fundamental to do initial research and having done people’s techniques. With the information that shows the point of view of the different users we can create more adequate customer journeys. 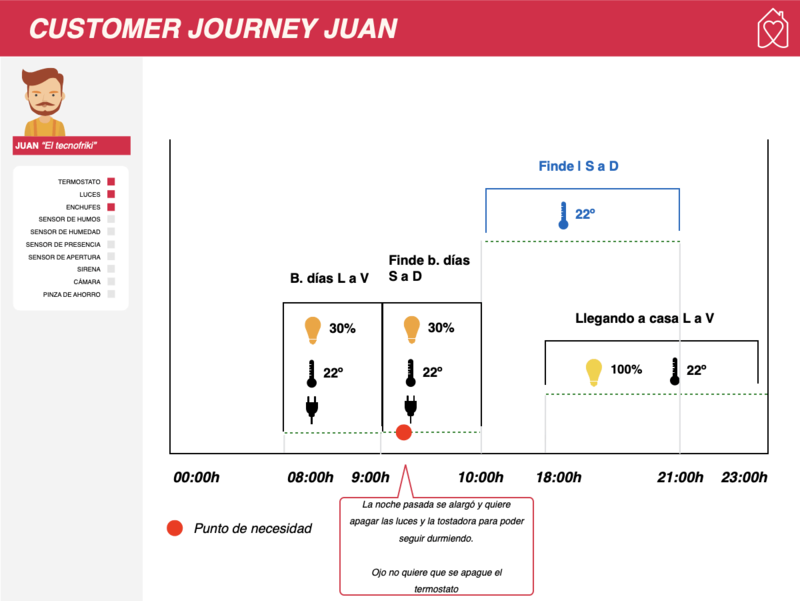 Customer journey maps are nothing more than a technique that is applied within the DCU method (user-centered design) and that is mainly designed to describe the user’s interactions with the brand in order to successfully achieve a task. They also reflect the specific itinerary of a specific person in a scenario, emphasizing the emotions, expectations and behavior of the users. Aligning the external and internal vision, analyzing how the user lives the different stages of the interaction with the company and putting himself in his place to achieve alignment of the two visions and eventually find a more harmonious and natural life cycle. Understanding and redefining the experience of clients knowing their current experience, you can identify those points where the client feels frustrated, lost or bored. In addition, thanks to this resource, you will be able to discover interesting customer niches, detecting new business opportunities. There is no single way to obtain a customer journey, ingenuity and creativity can make a difference in this technique. 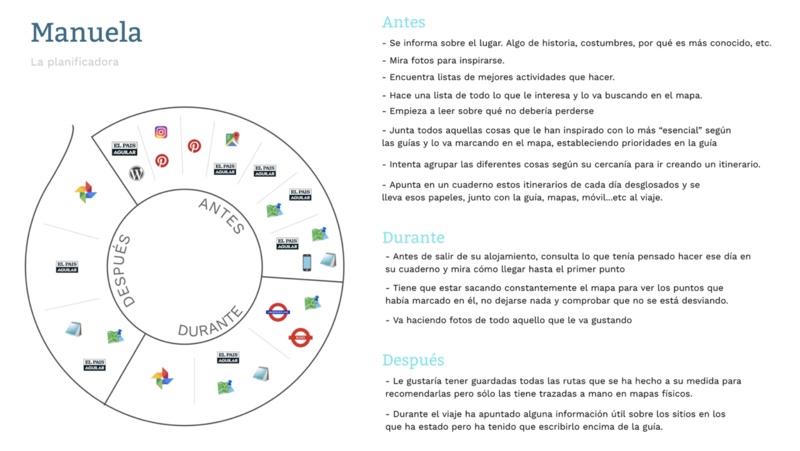 The way it is shaped will depend on the objectives, the type of product or service and the most relevant findings of the research, it is not the same to work a customer journey of a shopping process in a shoe ecommerce than a customer journey to obtain a ticket of metro in Madrid. 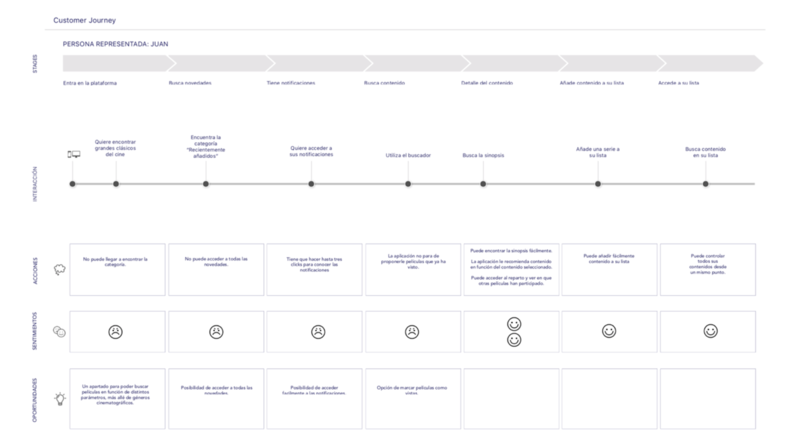 For something you have to start and then enrich, so I share with you a template type of Customer Journey Map that maps basic points and that you can take as a reference. I insist and it is important to understand it, it is not the key that opens all the doors, it takes this template only as an example since it is not an absolute truth and you can map customer journey with other attributes. The examples and techniques serve as a guide but you can create a new model without any fear and you will surely achieve your goals. What is each of the items reflected in this template? 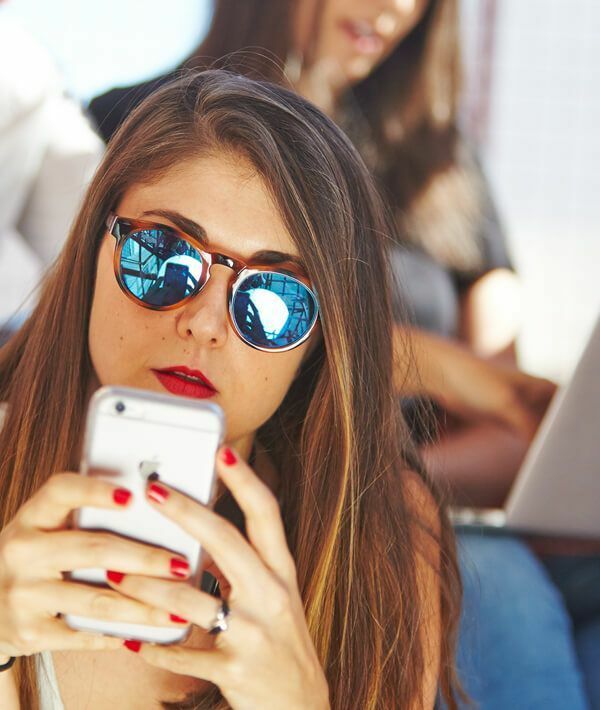 The Etapas are the phases through which our user will pass, they are not always the same, depending on the project and the findings obtained in the technique of people. An example would be: discovery, first contact, purchase or search, purchase and use. Only by knowing each of the stages that a customer goes through in his purchase process, is it possible to understand what he feels with each interaction. Actions or Acciones carried out by users in each stage such as: search in google, physical visit to store, comparison of prices, search for comments on social networks, etc. The touch points or points of contact are the moments where the user has a direct relationship with the company, it can be through social networks, attended in a physical store, call to the call center, sending a form, etc. 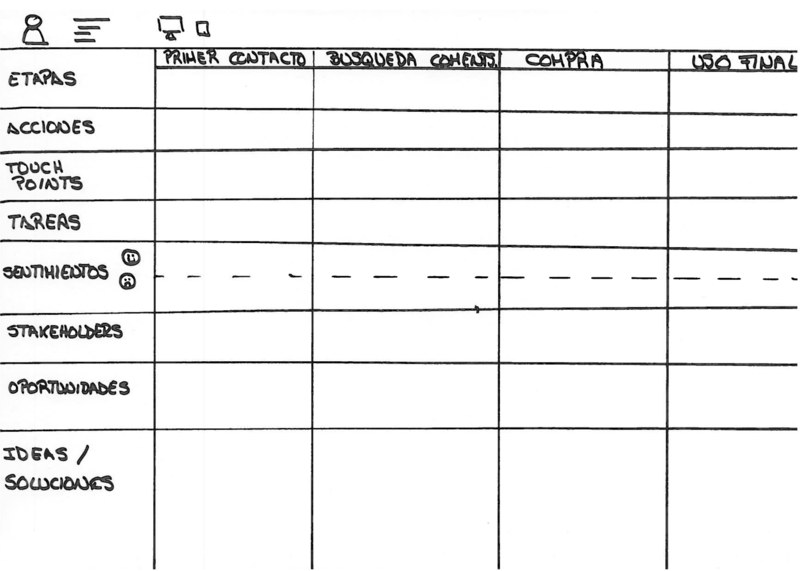 some interrelationships are repeated in the contact between the company and the user. So it is necessary to recognize and control them to start with a relationship as favorable as possible: website, mobile app, mail … give the keys to identify which are most appreciated by customers. Las tareas or tasks are those actions to be carried out by the users who buy the product or service. 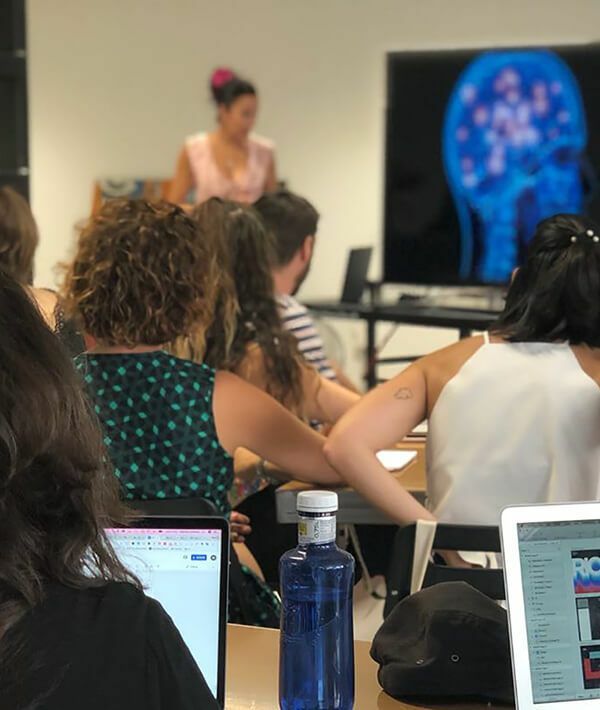 The Sentimientos or feelings is the analysis of the emotions of the users generated throughout the customer journey, leaving evident the points of contact that generate friction, satisfaction, the moments that are preferred by the users and have to be reinforced, etc. understand what it is that attracts / disturbs / scares / captivates the user in each phase of their process is the key to improving their experience and relationship with the brand. Oportunidades or the opportunities detect the points that can be key for the conversion of a user and that have to be taken advantage of by the company. Each point of contact is an opportunity to understand the client, to know him and therefore offer him a better service. Expectations must always be satisfied, because not reaching them supposes not making the client’s experience consistent. The customer journey reflects the specific itinerary of a specific person in a scenario emphasizing the emotions, expectations and users behavior. Do I have to always use all these items? The answer is NO, we can use these, only some, others different …, we have to adapt 100% to what we need for our project. To clarify these concepts, let’s see some different examples when building customer journeys maps. What would you need to take into account to improve the service of a food delivery website? In this case, the stages are fundamental to know the behavior of the users. Each of the stages that a client goes through in his purchase process, it is possible to understand what he feels with each interaction. What elements are key when planning a trip through an app? Being a proactive user who plans all your trips, it is very important the interactions and behavior that users will have before making the trip as they will use one information or another to organize and plan their trip, during the trip where the information consume will be fully functional train schedules, notepad, photo applications, etc. and after the trip as we will have to get the user to become a prescriber and recommend our app. What do I have to take into account in the customer journey of a user of a home automation application when it comes to programming the behavior of your home? The devices you have installed, the time slots inside or outside the house or the days of the week will mark the behavior of our users as they will not have the same needs during the week as the weekend. How would the customer journey of a user that uses a streaming content platform be? In this case, the stages are different from any others, since they are based on whether or not they have notifications and in the search for content. In conclusion we can say that conducting customer journey mainly serves to really put ourselves in the shoes of users and empathize with each of them, understanding their expectations on how to use the product or service. In addition we can not forget that customer journeys are of great help so that the work teams share the same vision about the context and the use of the service, thus generating a perfect alignment when developing a project. Mapping the customer journey can make the difference in the success of our product or service, but for that you have to break the rules and adapt the techniques to the needs of your project. Stay up-to-date on the upcoming Redbility Skills sessions, the latest success stories and all news related to Redbility. I agree that provided email address will be used for receiving information about our events. We will not transfer your data. Check out more information on our Data Protection.